A confection that will guarantee to impress! 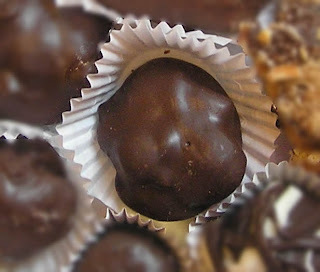 Creamy, chewy caramel, studded with chopped pecans and lovingly wrapped in chocolate. Line a large cookie sheet with a silicone baking sheet or with aluminum foil. If using foil, evenly coat with cooking spray; set aside. Psssst! Can I interest you in some crack? I made a ton of different candies so far, but my favorite is this most awesome bit of heaven called Almond Roca, which I found at Mel's Kitchen Cafe. Light and crunchy. Totally drool-worthy. I'm gaining weight just thinking about this stuff. 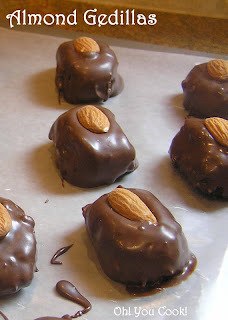 When I first stumbled over this recipe, I thought it very similar to chocolate-coated English toffee, and wasn't sure what the difference was. Mel never mentioned its origin, so I just thought it was a nifty name and didn't bother look it up. Until now. 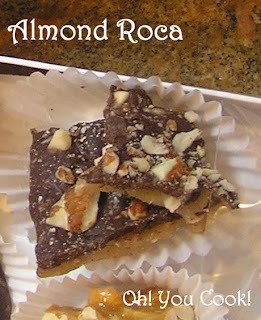 Turns out that Almond Roca is a brand name and I had never heard of it. So embarassing *blush*. Almond Roca is a little more difficult to make than yesterday's Almond Gedillas, because you need a thermometer to assure success every time. Undercook and you'll have a soft mess. Overcook and you'll need jaws of steel to enjoy these babies. Let's take a vacation from my vacation, and indulge in a week's worth of candy suggestions for Purim and/or Valentine's day. Purim is the Jewish holiday celebrating yet another victory against the forces of evil. To outsiders, the celebration traditions for this holiday kinda-sorta resembles Halloween with costumes and parties. But one difference is that when we head out, basket in hand, to our neighbors' door, wehand them the basket of treats. Mishloach manot(Purim baskets) don't really have to be baskets, but the container must contain at least two different food items: store-bought, home-made or home-grown. A more traditional treat for your mishloach manot is hamantaschen, a three-corner filled cookie. Since we've been there-done that, I will instead share a few traditional Valentine and non-traditional Purim candy recipes. Start drooling. In honor of Chinese New Year (this year on February 10th) and in observance of Super Bowl Sunday (this year today), I'm posting a recipe that works for both: Chinese-style meatballs! These meatballs are called Lion's Head because of their size. Have you noticed that inferior restaurants overcompensate for the lack of taste in their meatballs by forming them outlandishly large? Unlike those, here the combination of different flavors and textures is in direct proportion to their size; the only complex thing about them is the taste. In fact, because of their size these babies are easy to (gently) throw together. TIP ALERT! It's easier and faster to make large meatballs than itty-bitty ones. You're welcome. I'll be partying to the Puppy Bowl (still no idea who is in The Big Game ... 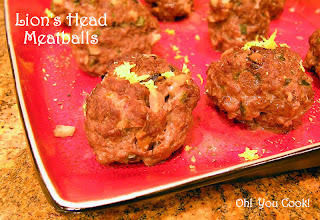 I watch the commercials), but if you plan to serve them as Superbowl appys later, feel free to make the balls about an inch in diameter, and only broil for 5-8 minutes.